Q: Isn’t the waterfall enough aeration for my pond? A: As your waterfall gurgles and churns gallons of water, it would certainly appear that your pond is getting plenty of aeration. All that action does, in fact, help with gas exchange and infuse oxygen into the water. But it isn’t always enough, especially if you run your waterfall pump for a short time during the day. Algae Battles: Algae thrive in calm water that’s devoid of – and in need of – oxygen and beneficial bacteria. If you regularly fight algae blooms, that means your pond is out of balance and could use some additional oxygen and movement throughout the entire water column. Oxygen-Starved Fish: Fish that need more oxygen will hang out beneath your waterfall, where oxygen supplies are the densest. They may also be coming to the water surface, gulping and gasping for breaths of air because there’s not enough in their environment. Too Many Fish: The general rule for a fish population in a pond is to allow 1 inch of fish per square foot of surface area. If you have too many fish, or your existing population has outgrown their space, aeration is critical to their health and well being. Stagnant Water, Mosquito Boom: Is the water stagnant in certain areas of your pond? Are you suffering through a mosquito boom in your backyard? These little pests prefer to lay their eggs and raise their young in still water – so you might have created a perfect mosquito habitat! Muck Accumulation: Decomposing plant matter and fish waste build up when the water is still and your biological filtration system can’t keep up. That muck feeds the algae blooms, which create more muck. Do any of these ring true? 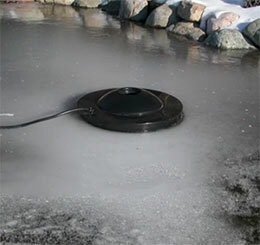 If so, your waterfall or stream is not providing enough aeration for your pond. An aeration system can help. The Airmax® PondAir™ Water Garden Aeration Kit is designed for smaller water gardens up to 2,000 gallons and The Pond Guy® Water Garden Aeration Kit is designed for water gardens and koi ponds that are up to 4,000 gallons. Both whisper-quiet systems can be run 24 hours a day, seven days a week, providing your finned pals and beneficial bacteria plenty of oxygen and water movement. Pond Talk: Have you noticed any of these issues in your water garden?